Mountains, forests, and rugged beaches make Vancouver Island, British Columbia the ideal place for adventure and exploration. I just got back from a week of travel shooting and road tripping all over the Island to expand on my expansive Pacific Northwest photography series. Splitting my time between the great outdoors and cultural landmarks, I did my best to capture iconic locations as well as find some unique spots off the beaten path. I spent my days hiking the coast, driving winding mountain roads, touring B.C. 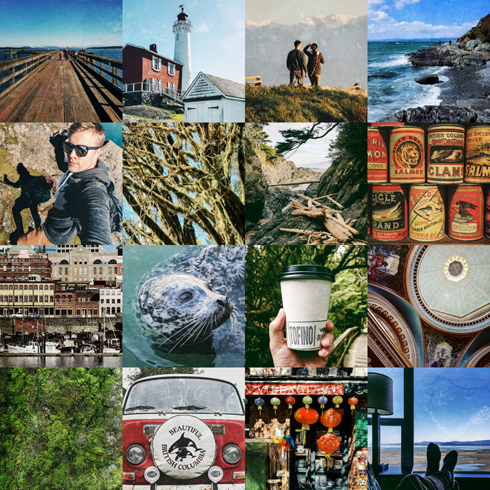 's capital, photographing surfers in Tofino, exploring some breathtaking historic sites, and even reconnecting with some friends from university just before my birthday. All in all, it was a really eventful week. I brought back a handful of treasures from my journey (see below). This included some beer and glasses from the Tofino Brewing Company, some archival images and a vintage 1925 newspaper from Victoria, and the cake toppers from my birthday in Nanaimo. More to the point, I encourage you all to stay tuned as this new collection of images from Vancouver Island is added to my Pacific Northwest series. See the entire list of locations here.